This is another family favorite that I haven’t made in awhile. About 15 minutes of prep, an hour in the oven (while I finally got a couple blog posts written) and dinner was done. 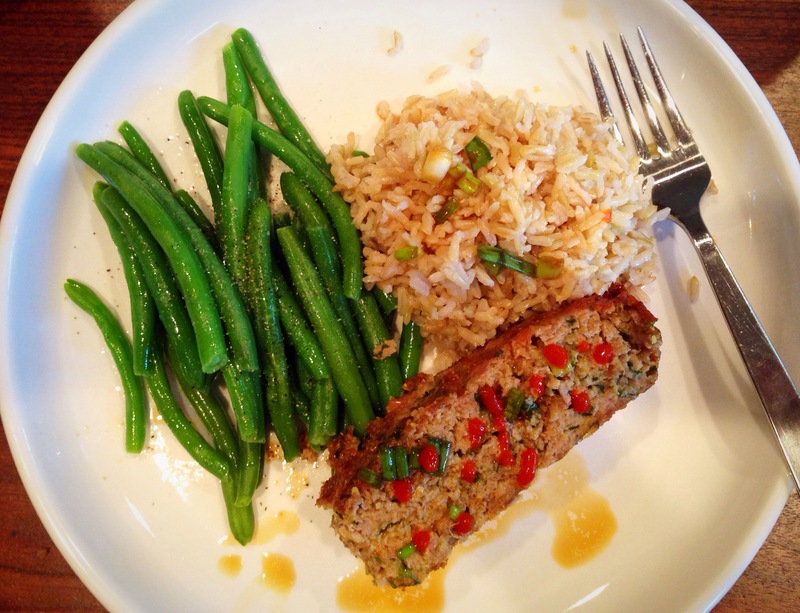 This meatloaf has great Asian flavor- Especially with a little of the sesame lime sauce. I have also served this meatloaf as meatballs for an easy appetizer. Cooks in half the time and you’ll blow your guests away with a tasty treat they haven’t had before. We did this at Real Food Bliss and it makes a great freezer meal- just make the meatloaf up ahead of time in a loaf pan, stick it in a gallon size freezer bag and freeze it. Thaw it over night in the fridge and bake as a meatloaf or roll it into balls. I love meatloaves and meatballs because you can really stuff them full of good healthy stuff your kids wouldn’t normally eat on their own. This recipe calls for a large handful of cilantro which is SOOO good for you! Its a great heavy metal detoxifier and its full of nutrients like Vitamins C and K, potassium, folate, and anti-oxidants. Sesame oil is also full of anti-oxidants and has been found to help lower blood pressure when incorporated into your daily diet. What’s not to love?? Preheat oven to 400. Spray a loaf pan with cooking spray. Put all ingredients in a large bowl and mix well with your hands. Place meat mixture into loaf pan and bake for 60 minutes (30 minutes for meatballs on a baking sheet with sides). Now make the sauce. Put all ingredients in a plastic container or small jar with a lid. Shake well to mix. Drizzle over the sliced meatloaf or use as a dipping sauce for meatballs. Goes really good on the rice as well.